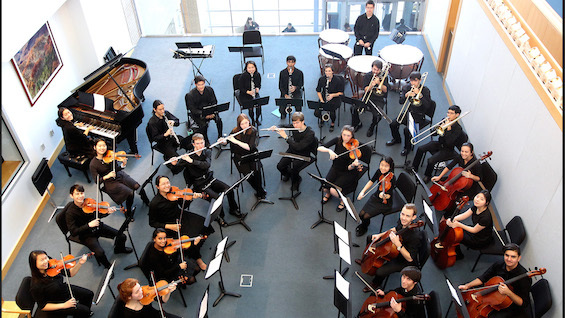 The Olin Conductorless Orchestra (OCO), an innovative ensemble that performs collaboratively, minus conductor, will present a free concert of classic and contemporary works. The program includes Gershwin’s An American in Paris, as well as works by Shostakovich, Mozart, and Benny Goodman. Performing without a conductor, OCO features instrumentalists in leadership and collaborative roles. Dedicated to orchestral performance in the concerted spirit of chamber music, the orchestra forges individual participation, active listening, and group-motivation into performances that have established it as the only conductorless orchestra composed of engineers in the world. Based at Olin College near Boston, OCO has an essentially flat hierarchy that incorporates an ever-evolving sense of culture and cooperation as a working ensemble. OCO functions as a team of musicians—regardless of position—comprising students, faculty, and external guests, all dedicated to making good music with intensity, camaraderie, excitement and humor. RSVP requested.